If you are looking for examples of Yorkie hair cuts or hair styles, please visit our page on Yorkie Hair Styles. 1) Bathing is a must! Frequency of bathing depends on the type of shampoo you use on your Yorkie and, of course, on how dirty he is. I only use Yorkie Splash, and I bathe my fur babies once a week. Our shampoo does not strip the natural oils out of the skin and hair, and bathing more frequently is okay. But, if you use a standard shampoo (one with alcohol and other chemical ingredients), it is (in my opinion) best to bathe your Yorkie about once every 2 or 3 weeks. Chemical products can remove the natural oils from the skin and hair. This can cause damage to the hair and cause excess production of skin oils if used too frequently. But, if your Yorkie is dirty, give him a bath. As far as conditioning the hair, you should do that each time your bathe your Yorkie. For Yorkies with a more cottony or a modified (part silk, part cotton) coat, more frequent conditioning may be required. As far as products are concerned, I use our own shampoo and conditioner, Yorkie Splash and Yorkie Shine, for regular bathing. 2) Regular brushing is an important part of Yorkie grooming. Never brush a Yorkie if his coat is dry. This can cause the hair to break. 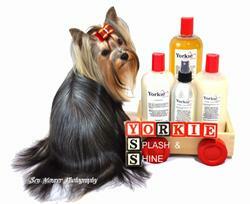 When you brush your Yorkie’s coat, use a spray conditioner to soften the hair. I, of course, recommend using Yorkie Sheen detangler and coat conditioner. When brushing the hair, start at the end of the strands of hair and work your way up to the body. If you encounter a tangle or mat, do not pull on it with the brush. Use your fingers to pull apart the tangled hair (again, working from the bottom upward), then gently brush through the tangle. Be sure to check the underside of your Yorkie where the legs connect to the body – this is where most mats occur and they are easily overlooked. As far as what products to use, I use a Madan Pin Brush for Yorkie coat daily brushing. For smoothing and drying I use a Boar Brush, and for the face hair and sometimes for tangles I use an All Systems Ultimate Combination Comb. 3) Yorkies need special attention paid to their teeth. Yorkies, like other toy breeds, are prone to tooth decay. Regular brushing of your Yorkie’s teeth is a good idea. There are many tooth cleaning products made for dogs, and you can find a tooth brush and paste at any pet supply store. The liver flavored toothpaste is usually a big hit with most Yorkies. Suburban Dog House sells a vanilla flavored kind for those who prefer something sweet. 4) A Yorkie’s nails need to be kept trimmed. You can have your vet or groomer do it for you, or, you can trim the nails yourself. I use a Millers Forge Pet Nail Clipper. It has a safety bar on it to help guide you when trimming the nails. Part of the difficulty in trimming a Yorkie’s nails lies in the fact that the nails are black, and it is hard to tell where the underlying skin begins in the nail bed. If you are going to trim your Yorkie’s nails yourself, it is a good idea to have some corn starch or flour on hand in case you do cut the nail too close and cause the nail to bleed. Some people prefer a styptic powder or liquid to stop a bleed (something like Kwik Stop), but, I prefer something as natural as possible. Flour is the best thing I have found to stop nail bleeds. I have used a styptic pencil on myself in the past, and it burns, so I try to avoid using styptic products. 5) For younger puppies and some adults, it is necessary to keep the ear hair trimmed. This is something you can do yourself at home if you like. In order to encourage a puppy’s ears to stand erect, it is important to remove the added weight of the hair on the ears. There are many different opinions on the best way to do this. Whichever way you are most comfortable with is probably the best way for you and your Yorkie puppy. For regular grooming of a Yorkie whose ears are standing, the technique for trimming the ears is to use a small electric trimmer (the same size as is sold for beard trimming). There are many great products out there made by companies like Andis, Wahl, and Oster. For the pet owner, you can get a clipper at a low price somewhere like Walgreens for about $15 - $20. Using the trimmer, clip the hair on the ears in the shape of an upside down "V" on the outside top ¼ of the ear. You can also use the trimmer to shape the hair on the feet and to trim the hair in the pads. For puppies with thicker ears, I take off the hair about ½ way down the ear on the outside and about ½ of the ear on the inside. For Yorkie puppies with thinner ears, I take off about ¼ to ½ of the hair on the outside, and the same on the inside. If you prefer the look of more hair on the ears, you can trim the hair on the ear tips with scissors. I usually just get as close to the ear leather as I can, holding the edge of the ear between two fingers (length-wise to protect the ear) and trim off the tips of the ear, about ¼ inch on each side of the tip. a. Along with trimming the ear hair, it is a good idea to clean the ears. A dog's ears are dark, moist places that can be prone to bacterial and yeast infections. Keeping the inside of the ears clean can prevent a lot of headache. To clean the ears, you can use any store brand ear cleaning solution, or you can make your own solution of ½ rubbing alcohol and ½ vinegar (any kind of vinegar will do: white, apple cider, etc.). Put a few drops of solution into your Yorkie’s ears and use a cotton swab around the inside of the ears to remove the debris. Be careful to only swab the part of the ear and ear canal that you can see. Though, because of the anatomy of a dog’s ear it would be very difficult to harm the ear drum with the cotton swab, going too deep in the ear canal can pack any debris further down the ear canal. If your Yorkie has a lot of debris in the ear or if you suspect an infection, take him to your vet. Ear infections can be very painful and difficult to get rid of. The best way to avoid infections is to keep the ears clean and to get your Yorkie to the vet if you suspect an infection (the ear is red, hot, inflamed, or your Yorkie seems to be bothered by it). 6) It is also a good idea to keep the area under your Yorkie’s tail trimmed. Long hair in this area tends to get rather icky pretty quickly. How you trim up this part of your Yorkie is up to you and your comfort zone. A lot of people leave this to the groomer. Some people use an electric trimmer or scissors. 7) As far as trimming the hair over the body of your Yorkie, I recommend taking your baby to a professional groomer. If you want to trim your Yorkie’s hair yourself and you feel comfortable, go for it. But, for most pet owners, it is easier to take their Yorkie to the groomer once every month or two as opposed to the stress of clipping the hair themselves. 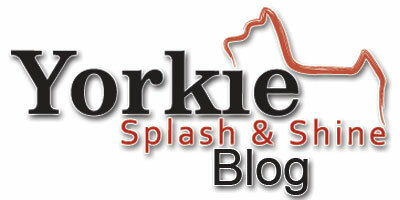 If you decide to trim yourself, there are some great ideas on our Yorkie Hair Styles page. You can use scissors or trimmers or a combimation. If you use trimmers - remember to always cut with the growth of the hair, not against, or you will have a bald baby on your hands.